T-304 Stainless steel rods. 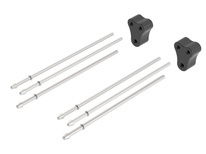 Kit contains (4) 5/16" diameter and (2) 7/16" diameter rods, and (2) rubber isolators. Natural mill finish can be brushed or polished prior to installation. To see how to use these hangers check out the "How to Install Link". Hanger/ Isolator Kit. Can Be Welded To Any Muffler Neck, Borla Pipe Bracket Kit, or Borla CrateMuffler Bracket Kit. SHARON'S AREA ASSEMBLES THESE. PUT W/O SHEET IN SHARON'S BOX.